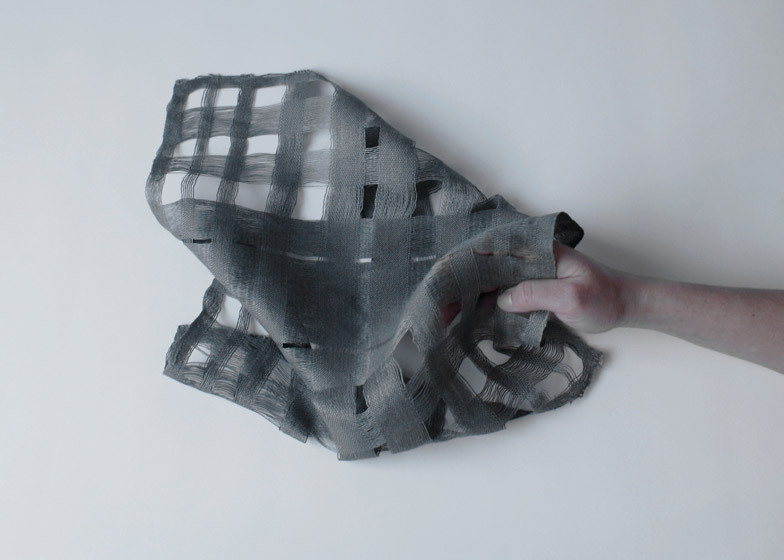 Dutch Design Week 2014: these textiles by Design Academy Eindhoven graduate Alexandra Stück are infused with different remedial herbal scents to make the wearer feel calm, focused or horny. Combining Alexandra Stück's aromatic liquids with water and handwoven linen fixes the therapeutic scents into the linen for up to six months, to be released by body warmth, touch or movement whenever the fabric is used. Inspired by the alternative therapies developed by 19th century German monk Sebastian Kneipp, Stück worked with five scents that are claimed to have certain health benefits: germanium and valerian root to provide comfort and strength after psychological trauma, lemon balm to balance the cardiac cycle, peppermint to promote concentration and focus, pine for blood pressure and rosemary to restore libido and sexual function. "The scent molecules reach your olfactory organ and create a certain instruction in the brain, like, decrease stress, increase concentration, lower blood pressure, balance the cardiac cycle, depending on each plant and its remedies," Stück told Dezeen. Taking the essential oils from each plant, she developed a liquid "scent dye" that can be hand-washed into natural linen and fixed for up to six months by ironing the fabric. "The textiles were designed with an open weave that allows the scent to diffuse to your nose," said the designer. "The textiles are organic linens so they're not coated or chemically processed. I rubbed them to make them shiny and have a nice finish, but I didn't use any chemicals, so they still have the ability to open up in warm water – something linen does naturally. Both the scents and the fabric originate from plants so they work together." Keen to find a contemporary application for these ancient remedies, Stück designed the textiles to be used as scarves, handkerchiefs, bed linen, towels and other interior products. "The ingredients are 100 per cent natural," she said. "Artificial scents used by the detergent industry cause allergies and create hypersensitivities on our skin." Stück also developed a linen Body Sports Patch, which releases the fragrance of German pine forests in response to body heat to connect users exercising in cities and gyms with nature. "You can wear it when you're running in an urban environment, but seeking nature, when you want to be in your bubble and add another layer to your sporting experience," said Stück. The Herbal Kneipp Textiles project was presented during Dutch Design Week, as part of the Design Academy Eindhoven Graduation Show, where Stück has recently completed a bachelors degree in the Man and Wellbeing department.